There are so many ways to cut my lessons learned from 100 Strangers, 100 Days. Today, I’m going to give you a slice of the grander, big-picture lessons. I’ve written 24. Yes, that’s a lot. However, I probably could’ve written a hundred, and indeed, I thought about it. However, that’d be overkill, and you likely wouldn’t read it anyways. It doesn’t take much to start something important to you. I came up with the idea for 100 Strangers, 100 Days while hiking one Saturday morning in September. Within two hours, I interviewed my first Stranger. Within six hours, I had 100Strangers100Days.com up and running. It doesn’t take much to start, and get something off the ground. Just takes focus and commitment. It takes a lot to be consistent. The hardest part of the journey was not meeting Strangers. It was meeting one and writing about the interaction each day for 100 days. Some days, I wasn’t feeling up for it. However, I did it because that’s what this journey was about. Being consistent. Being deliberate. Meeting people. This is what separates the true doers from the wanters – executing. You can meet people everywhere. I walked up to Strangers with familiar faces around the office, Starbucks, and yoga, primarily. However, I also met complete Strangers in these places plus while shopping, walking on the street, hiking Stone Mountain, in line for a restaurant in Boston, everywhere. Meeting new faces is not as hard as many believe. Couple this with explicit networking events, and you can meet like-minded people and build new and existing circles. Things may always be awkward, but you’ll be comfortable about it. I was pretty natural, I think, at the beginning. However, I was still uncomfortable and anxious walking up to complete Strangers to ask them to share their stories with me. That was true up to Day 100. However, I only need to be confident and happy with what I’ve done, so far, for many of those feelings to melt away, and even give light to excitement. I wholeheartedly believe I can walk up to anyone today, and strike up a conversation. Each opportunity has one thing in common – you. Even when I got rejected, the next person was a new opportunity. I remember being rejected three times in one day before finding a Stranger to talk to me. But each subsequent Stranger knew nothing about the person before rejecting me. I was the only person who knew. It’s important to know what happened, but to keep positive and keep authentic with each Stranger. Think about that if you’re in sales. People want authenticity. By the end, I had a near 80% acceptance rate. More than half of those who turned me down either because they didn’t have time, or just weren’t open for the picture to be taken. Otherwise, people were very open to just talking to me and sharing their stories. I approached many Strangers who were staring at their phones or working on their computers. Yet, they allowed me to interrupt them, and many smiled as I shared my journey and asked them to be the Stranger of the Day. All of them smiled at the end of our meets. Support comes in many forms. I had several friends share my journey on their many different social media accounts, and one friend who helped me troubleshoot my website when it went down a few times. Then, I had friends who would ask me questions about how it’s going, but weren’t open to sharing with their friends publicly. There are segments of support in almost everything you do. Know who they are. Some of the closest people are the most skeptical. I was surprised I was still surprised at this. That is, when I shared #100Strangers100Days with some family and friends, they laughed at the journey with heavy doses of skepticism. They were more skeptical and teasing of the journey than others. Again, realize the segments of support. We don’t see ourselves as beautiful as others do. I took hundreds of pictures of Strangers – several takes for some. I found many takes to be great the first time, but the Strangers would laugh awkwardly and tell me they thought they were ugly. Meanwhile, I took many candid pictures by snapping pictures while they laughed or looked around. Despite many Strangers posing for the camera, these same Strangers wanted me to share their candids. Not a lot of people think about who they are, or what drives them. A lot of people paused for long moments when I asked them, “Who are you?” Many admitted they didn’t know, and had to think hard. Meanwhile, I had Strangers talk to me days after our meet to share they thought more about the question. It’s interesting how people describe who they are by what they do for work or their relationship status – typically, modes that are extrinsically influenced. It’s not rambling, it’s sharing a passion. I remember running into a Stranger weeks after we met, and he felt that he rambled on during our meet. I told him that’s not how I felt at all. Whenever someone put me on a path and carried it, I liked that a lot. They shared what was on their mind, and in many cases, they shared their passion. Their excitement helped spur a little bit of a monologue, but that was a great thing to hear. Not everyone allows his/ herself to have a passionate monologue. You’ll never be yourself as long as you’re being what everyone wants you to be. A recurring theme I heard from others, and one that I lived the premise of through this journey, was being comfortable with who we are. There were Strangers who kept their passions from loved ones because they didn’t believe friends and family would appreciate the passions like they did. Meanwhile, as I mentioned above, I had my own skeptics from friends and family. If I was truly worried about what others thought of this journey, I probably would’ve stopped this long ago, let alone not started. Don’t be like everyone. Don’t mind whatever “weird” is. Be yourself. People just need moments. People need moments to connect. People need moments to escape. People need moments to get in gear to talk about themselves – what drives them. People need a few minutes to set the day-to-day aside. It doesn’t take long or need extraordinary effort to do something or to achieve a smile. It just takes one moment. Every meeting was just a snapshot in time. Important to recognize we’re all dealing with different things at any given time. I remember a couple Strangers who shared how you never know how others are really doing. Being nice requires no money or skill. Opening a door with a big smile can transmit energy. Someone might have just sold an important life memento of a loved one while burying a best friend. Take a moment. Live in the present. And recognize the power of a single connection right now. Look up and connect. Over time, the journey became more engaging. Yes, I got better at the approach, but really, our conversations started to flow as my style evolved. At the beginning, I took notes with a pen and paper and a bank of questions. Over time, I stopped asking set questions except for the first question – “Who are you?” Then, I let the conversation flow from there. I then used a voice recorder, so I can look up during our entire interaction, and let the conversation flow. Readers recognized this shift, and responded accordingly telling me how the stories were much funnier, more engaging, and just flowed so much nicer. Let this be a lesson as you’re around others and you have that itch to look down at your phone. Small goals can work against your much grander goals. Goals are a funny thing much like a Stranger once told me about reaching goals. I kept my eye on Day 100. By doing so, I also had “pocket” Strangers – referring to something like a “pocket veto”. In this case, I knew there were Strangers around that I had seen enough that breaking the ice and engaging them would be really easy. With that, I wouldn’t meet them unless I knew I may have a “difficult” day coming up – like, I would be extremely busy, or would not see as many people. So, I saved these Strangers for difficult days, just in case. What this really did was give me too much comfort and delayed the grander ambition to make connections. Be aware of those goals and those metrics you measure. Get to know people to break biases and judgements. I caught myself a couple times looking at someone and making a snap judgement. When I realized I made a negative judgement, I told myself to go ask that person to be the Stranger of the Day. I wanted to force myself to get to know people, and beware of snap judgements. Each time I did this, I discovered something great about the person. People think you need a novel concept to start something. You don’t. A lot of people (friends and Strangers) were amazed by this journey. They were inquisitive about how this journey came about. They were fascinated about the stories. They then thought they couldn’t do it, or they could never think of a journey like this. Here’s the thing – meeting Strangers is not novel. Writing about them is not novel. I just wrapped it all up in a package, and did it. It’s almost always about execution, not the idea. Each connection is a connection that can change lives. I had several friends who read about a Stranger they had seen before, and then, they actually went to meet the Stranger. They used the Stranger story as a foot in the door to get to know the Stranger even better. I’ve even connected some because of business synergies. The most obvious connections are sometimes hidden in plain sight. People are great. People are beautiful. You can connect with anyone. To the point above, we all have some amazing story somewhere in us. The people around us are not that strange after all. The people around us are not as foreign after all. We are all connected in some way, and you’ll find that when you take a moment and say hello, and go beyond the hello. You’re sometimes never really ready, but you kind of assimilate to whatever success looks like just by doing. This lesson kind of wraps up a lot of the entrepreneurial lessons above. That is, the level of effort I put into this was a lot more than I originally thought. Had I known this, I’m not sure I would’ve started. I was nervous walking up to some Strangers, but once I put my feet together or said hello, there was no turning back. Sometimes, the best thing you can do is to fire before you ready yourself and aim. Happily, I’ve found I’m pretty good at this whole make-it-up-as-I-go-along-and-learn-and-adapt thing. Just go. It’s been a little over a week since I wrapped up my 100 Days. It’s been odd many days not “having” to meet a Stranger. I’ve caught myself a few days walking into a room, and wondering who in the room I should meet for today. Then, “Oh, wait, I don’t have to today.” My days have definitely been a little simpler without an additional priority in my day-to-day. So all in, I had to ask 126 people to find 100 Strangers to share their stories putting the rate at 79.37%. That’s not bad. Starting out, I didn’t have a strong feeling if this would be more difficult. However, I was a heck of a lot more nervous walking up to people. In many cases, the Stranger who rejected me told me why (i.e. no time, no picture). However, for many of the plain “disinterested”, I didn’t get a reason, and I never asked why. I usually chalked this up to they just didn’t want to do it, or they thought I was weird. I put them into the big “disinterested” bucket because I gave them the reason. I gave them the reason that “they were private”, “they didn’t care for my journey”, or I read their facial expressions and saw, “you’re strange, get away from me”. After hearing Jia’s talk and how he responded with rejections by asking, “why?”, it made me wish I could go back in time and do the same. In a sales role in my professional life, I want to get better at dealing with rejections, and getting to the root of people’s rejections. There are nuggets of insights that I’m missing out on by not asking deeper questions. In several instances, I still spoke with the Strangers. However, I didn’t share their stories (those who wanted to remain private). However, I might have missed the opportunities with those in the “disinterested” bucket to learn more about people. Everyone’s asking me for the lessons learned. I’m getting to them. Then, I’m also wondering how many people will try to learn their own lessons, or are they looking to me for the Cliff’s Notes. Meeting the 100 Strangers required no patented process. Required no money. Demanded little time. Anyone can do this. The lessons will be my own, and though, I might paint them in a light that is best seen and understood by others, they will be mine. Meeting a handful of Strangers today, tomorrow, over the next two weeks, and learning from the experience (and maybe making some great connections), just requires an initiative. Then, those lessons will be your own. Don’t need to blog about them. Don’t need to bust out a voice recorder. Don’t need to start with “Who are you?” Instead, your lessons and journey starts today, and can take whatever path you wish. It’s been a while since I shared some of the thoughts flowing freely in my head, so let today be the great day I share. Plus, there are only two weeks left on this journey — about as good a time as any. That’s not too bad, right? I mean, including today’s Stranger 86 + the total rejected (23), that’s a 78.90% acceptance rate. When I started, I didn’t have really have expectations of what this number would be. Thinking hard, close to 80% seems pretty darn good. Nice to Meet You! …Again! So today, I saw… a bunch of former Strangers. I run into some of the (former) Strangers a lot. Some, I’ve actually become good friends with. That’s pretty cool. One former Stranger today, shared with me feedback from our meet, and feedback he received from sharing his story. It was fascinating, and also, in line to some of what I’ve shared previously. His girlfriend commented to him that she didn’t know he was so smart. I was intrigued by this because I got this from just a few minutes of talking to him. Maybe she’s that smart. He then let on how he doesn’t always share some of the passions he has, and the literature he reads. He didn’t believe that she would appreciate this so much, but he does share in her passions. I thought that was interesting, too. Though, I’m not surprised because he’s a great guy, and seems to align to his partner’s interests. However, I encourage him to share more of his with her. His friends didn’t know much about his passions. They were surprised by his depth. He commented how he often kept things pretty “high level” or at the surface. Much like his girlfriend, he didn’t feel they would appreciate this (maybe even not understand his passions). I, again, encouraged him to let them make their own decisions, not he make decisions for them. Being vulnerable means handing over the keys and trusting the other will, at least, respect who we are, if not share in the passions we have. The bond that’s formed by opening up more is a powerful one, and you don’t get that without creating a deeper connection. You can’t always be so open and talk about “deep” things all the time. As much as I love a good talk, high-level “superficial” stuff is great banter and keeps conversations light. Not every conversation needs to get so deep like I go with the Strangers. That’s important. Let others in and be vulnerable, but don’t go deep every time. That’d be like always sprinting whenever you put your running shoes on. Maybe you want to jog. Maybe you’re just walking around the grocery store. Today was Day 86. 86 Strangers, I’ve met and gotten to know. Wow. The first 50 took a while to get to, I feel. However, the last 36 have been flying by. It’s been something amazing and radical to be a part of. I’m real curious what happens with the next 14 days because I won’t be in the office as much — which has been a great source of Strangers. I run into so many Strangers with familiar faces. Meanwhile, Christmas may be a tricky day to find a Stranger depending on what’s open and who I can run into. On that point, I’ve been speaking to several friends about this recently — I’m really not fazed to talk to someone, even a complete Stranger now. I’ve found that confidence where “hey, this is a cool project, and I want you to be a part of it” just rolls off the tongue. (No, that’s not really what I say, but I’m paraphrasing.) It’s fascinating to me because I really am not worried as I walk up to complete Strangers… even groups of people. Maybe it’s the responses and feedback the former-Strangers are sharing with me that is instilling in me this drive and confidence. Their enthusiasm and interest (like the former Stranger above) is enough for me to run on. This energy shows me how this journey will resonate with the right people — the people I’m interested in attracting and inspiring. So let’s see how the rest of this journey goes, and let’s see where this heads next. Or rather, where I head off to next. Before that happens, I’ll just keep meeting people. One Stranger and One Day at a time. I pretty much ask every Stranger “Who are you?” Perhaps just as interesting is considering who someone is not based on who they are and what they do. For me, I interpret this question as what others may think of me and, more importantly, why I am not someone I can see myself as. So who am I not? I am not a workaholic. This probably comes up today on Thanksgiving, as I was sitting at Starbucks tip-tapping on my computer (much like I am now). This exact moment last year, I was sitting outside a Starbucks drinking my cup of iced green tea while making revisions to my first manuscript of Postmortem of a Failed Startup. What I do, I do because I love. Sure, there are moments that I work. However, I also spend a lot of days like today, Thanksgiving, writing and perfecting my craft. It’s not work much like I don’t view my leg workout this morning work. Last night I was at yoga. That’s not work. Writing and reading is not work. It’s what I love. It’s like a sport. It’s like my meditation. Striving to improve and challenge myself is my sport, and how I do that is in many ways. For some, what I do may be work. For me, I view it as something so much more… enthralling. I’m doing something so beautifully and innately me. What I do stretches my imagination and creativity. What I do challenges how I did things before. As I’m typing this, I’m recalling the many times I’ve described my day-to-days to others, and their responses echoed to the familiar — “that sounds exhausting!” I’m smiling and laughing at this right now because some days, yes. But so are my morning workouts — just as my best bud and workout partner would say as I huff and puff after a set. I push myself to the limits because I thrive on that. But it’s a different type of exhausting than working the 90-hour-weeks in a cubicle crunching spreadsheets. (That could be your sport, but it’s not mine.) One of my passions and indeed sports is self-improvement and self-challenges. I strive to be the best… in all the things that matter to me. To me, it’s all game, and I want to have fun. I want to win — which is to be better than I was yesterday. I haven’t approached a Stranger for today, yet. However, I’ve been meeting all sorts of people including friends who are curious about the journey. Meanwhile, I’ve been thinking a lot about this journey, so wanted to share some of these thoughts with you — skepticism, race, and considering altering my approach. Add together the 57 Strangers I have met, and that means I’ve approached a total of 74 with a “success” rate of 77.0%. I don’t get incredulous reactions about this journey as you might think. A good number of the 57 Strangers are skeptical at the beginning, but they just start having fun with our encounter. Yet, I get the most skepticism and incredulity from my family and friends. Despite knowing I’m this guy who just “does stuff”, I’m a writer, I’m an entrepreneur, etc., they’re all so skeptical about this. Yes, I’ve even been teased, goaded by my own family and friends about it. I have to keep my straight face and share my vision and purpose for this journey to set in so they can put their skepticism aside — at least, momentarily. Curiously, most of my women friends are totally for it, and love the idea. The men… are split, but mostly 80-20 where 80 represents the skeptical. They eventually come around, though. Or at least, in front of me they do. This whole experience reminds me of several entrepreneurs telling me to not share initial ideas with friends and family unless they really understand me or can add value. For some reason, those closest to us tend to be the most skeptical and, sometimes, the more likely to reject an idea. Perhaps because they want to protect me from potential heartache or some financial struggle. They want the best for me, right? Still odd. Perhaps this is also why when I have a good idea or just an idea I’m excited about like this one, I know who the first people are that I talk to. Then, when my idea is in-flight do I share with others. I was talking to another friend — though, we’re not “close” — about the journey. He and his fiancee didn’t know about this journey till I told them then. I shared with them a few stories where people have really opened up about how race has affected them. Especially given the recent election, race is a hot topic (again). I try to vary the demographics of the Strangers; though, I stick to my normal day-to-day so perhaps it’s not as varied as it could be. In any case, I have found so much commonality and other poignant points with each Stranger I’ve met. My friend pointed out how this journey can be great to also bring communities together by showing the similarities we have as humans and people of this “community” and how everyone has some fascinating story behind them. My friend then shared how he’s encountered racism as a Muslim Indian to which I shared my own encounters. The crazy thing is that we don’t encounter typical “racism” all the time like derogatory remarks, but they happen quite often whether through seeing my black Tom’s shoes and thinking they’re karate shoes. Or when someone realizes I can speak Mandarin and exclaims, “whoa! I didn’t know you could speak Chinese! You’re like so un-Chinese!” What does that even mean? Do I have to talk a certain way? Eat a certain food? Dress a certain way all the time for people to realize I’m actually Chinese? Or maybe that I don’t look Chinese. I look more Korean or Filipino. Of course, I’m also the first to bring up how I’m a “ninja” in something (a moniker that was given to me long ago regarding my adeptness in Excel or in supply chain) or maybe that I’m great at math. Sometimes, I point these out just to keep myself laughing about it all… and before anyone else points it out. Hi, can I ask you a random question? What this entails is me asking you questions about your motivations and passions, and you can take whatever picture you want, and I put this on my website 100Strangers100Days.com. This is my way of inspiring people to connect with those around them. I feel like we look down so much at our phones that we neglect to say hello or get to know the people around us… some that we see every… single… day in our offices or at the coffee shop. We see them, and we may do the courteous thing and wave or smile or say hello, but we know NOTHING else about them. So I want to inspire communities to connect. Are you interested in being today’s Stranger? Now, I have this script down pretty darn well. Though it’s been working at 77.0% success, I find myself wanting to improve on this… not the “rate” but more about the success. I’m a big proponent of Simon Sinek’s teaching of starting with why (I’ve mentioned his Start With Why book often to Strangers). My script is actually the opposite of what Sinek espouses. The approach is actually very much what we normally do — start with WHAT (I have a passion project…) then flow into HOW (asking you questions about…) before ending with WHY (my way of inspiring people…). I want to reverse the script and see if I can get people pulled into this calling, this journey. Not sure when I will flip this script (almost literally), but I will soon, and I’ll let you know how this goes. So who’s a Stranger? Who do I talk to? Where? How do I choose them? Anyone who I don’t know anything about, or I just know a name. Nothing more (other than the obvious if they work somewhere, gender, etc.). I won’t go anywhere so far out to meet a Stranger. We have so many Strangers in our daily lives. I can stick to my typical flow, and meet people I see all the time, but know nothing about other than a face. The Stranger must not have read a Stranger post before — it keeps the conversation spontaneous and fresh. The Stranger must be open to a picture. This helps drive authenticity, and shows that the “everyday” person. Doesn’t matter if by picture time the person does a yoga pose or whatever pose that actually hides the face. The person must be open to the picture from the beginning, and then, the pose can happen any way s/he wants. I “randomly” pick the Stranger. Can be at a coffee shop or the top of a mountain. I can wait hours in the same spot, and will pick whoever I choose. I try to be diverse, and even if the person “looks” like s/he will reject me, I try. I want to trust the Stranger will allow me to ask the question. I have a “bank” of questions that I will draw from that reside largely in my head. I don’t ask the same questions, but hope my meeting with the Stranger will help draw the right questions. There’s just about no rules for the pose for the picture, nor is there a rule for what the Stranger can ask tomorrow’s Stranger. I’ll play moderator, as needed. No real format to how I post details from the meeting, but I hope it’s in a way that reflects our meeting, the Stranger, and what allows readers to best experience the meeting. Early lessons from my first 44 days on 100 Strangers, 100 Days… Why 44? Because I’m 23 days late. Whoops! Starting out, people kept saying this reminded them of Humans of New York. Didn’t know what that was, but after I checked it out, I can definitely see similarities. The team behind HONY is doing great. Just as many people have noticed, my approach is much different and my purpose is, too. I want this to go a little deeper into the Stranger. Why this project to meet Strangers? I’m in a great place in life — doing well with… a lot, and as hard as I’ve worked, I realize that much of my success is because of the people I know. Those people tend to have very different backgrounds, stories, and approaching work and life in different ways. I have many friends and colleagues who see the same, and they wonder how I know such varied crowds. Simple — I go beyond a “hello”. Yes, I’ll walk right up to Strangers just to meet them if they draw my eye just because. Yet, I still catch myself seeing many of the same people day-to-day, and I may nod to them and maybe say, “hi”. However, I know nothing else of them. Then, I look all around me and people are staring so intently at their phones not realizing the glorious stories just in front of them. In fact, this project really sparked in me as I was hiking down Stone Mountain in Atlanta one morning. As I was hiking down from the catching the sunrise, I noticed a man next to me who was walking alongside me for the last 5 minutes. I said to myself, “I might as well say hello”, and then, the light bulb came on. I thought about taking all that I have learned about connecting and meeting Strangers into a blog. Two hours later, I met my first Stranger. Six hours later, this site was born. This project is to help unearth the fascinating stories of people around me (around you). I’ll outline a few of the purposes of this project below. My motivations for this project that I started Saturday, September 17th. I should be wrapped up with my 100th Stranger on December 26! How wild is that? So what are the rules for a Stranger? What are the purposes of this project? To change the world for the greater through entrepreneurial endeavors. I have no idea where this is going to go other than 100 Strangers… 100 Days. I may ask some more friendlier faces as I realize, too, that some familiar faces are just surface-level connections. As I said earlier, I want deeper connections, so maybe I go beyond Strangers. I don’t know if this will be a book. I don’t know if this will amount to anything “commercially viable”, but I’m good with that. I hope this journey motivates bigger effects on us as a community, as a nation, as a race. We all have common threads as well as beautiful differences. I want us to embrace each other and the effects of this journey for greater aspirations whatever they may be. What do I want out of this project? Outside of the purposes above… nothing… Kind of. A few of the points in the purposes above are a little lofty because connections are great, but inspiring others to connect on a deeper level makes sense if the connections are sustainable. But then again, not every connection needs to be life-long… perhaps one or two will. Perhaps finding the deeper motivations of a friend will shape the rest of that friendship. Hard to say, but I hope! For me, this isn’t destined to be a book or a podcast — what many have suggested to me. I just want this to be “organic”. Meaning: I don’t really know what I want it to be. However, I want to move from Day to Day, Stranger to Stranger. I want to be present in my meetings, and I want to learn. That’s my only goal beyond inspiring and motivating others. For me, maybe this will change me for the greater which I’m sure it will. I’m just a regular dude trying to do extraordinary things one “inflection” point at a time… hopefully, change the world for the greater through entrepreneurial endeavors. If you want to learn more, feel free to contact me. Also, you can learn more about my motivations and me at www.EntrepreneurialNinja.com. 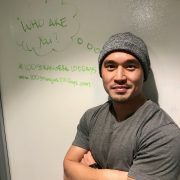 So stay tuned and check out these beautiful Strangers on http://100strangers100days.com – I’m on Day 12 today. 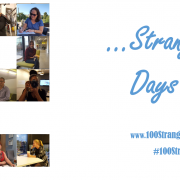 Also, you can follow the journey via Twitter @StrangersXDays or Instagram @StrangersXDays or follow the hashtag #100strangers100days!